Last update: October 12, 2016. 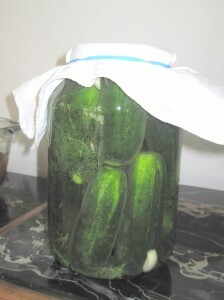 Naturally fermented in salt and water, with some herbs (lots of dill, some horseradish leaves, some garlic…), very much a personalized configuration of spices, flavors, and even methodology, is a traditional, very “Eastern-European” method of preserving cucumbers for the long winter season. Even as late as the fifties of the last century, these ‘gherkins’ were a staple component of Polish winter cooking, somewhat competing for popularity with — often home-made — sauerkraut. Dill pickles and sauerkraut provided us with a natural and almost exclusive supply of vitamins. There were no other sources of fresh fruit, fresh vegetables, lettuce. Most households had their own dedicated wooden or ceramic barrels, a piece of wood to place on the top of the fermenting substance, and a special, big rounded stone, found somewhere in the past, washed and used every year, to keep the wooden board — hence all the ingredients — under the fermenting liquid. But — the important note here is that this dill pickle is not the vinegar-marinated type. A totally different flavour. The dill pickled ones are used for salads, soups, and sauces. fresh cucumbers – preferably the medium size, hard, clean and somewhat similar size in each target container. Clean and wash cucumbers, drain. Prepare salt liquid – for each 1 litre of water you need 200g of salt, boil the water and dilute the salt completely. Set aside. Place some dill on the bottom of the jar(s). Load the cucumbers into the jar(s) tightly. Add garlic and fragrant leaves. Pour warm, but not hot salty water over the cucumbers. Make sure all cucumbers are covered with the liquid. You may need to use for weight over them to keep them under water. Cover the jar(s) with a piece of cotton, to keep out the dust and the insects. Keep in warm room temperature for a few days. Make sure the water it always on top. When the cucumbers seem sour enough to your liking, place the jar(s) in some dark and cold space. This entry was posted in Savoury, spicy and hot / ostre, kwaśne i inne. Bookmark the permalink.